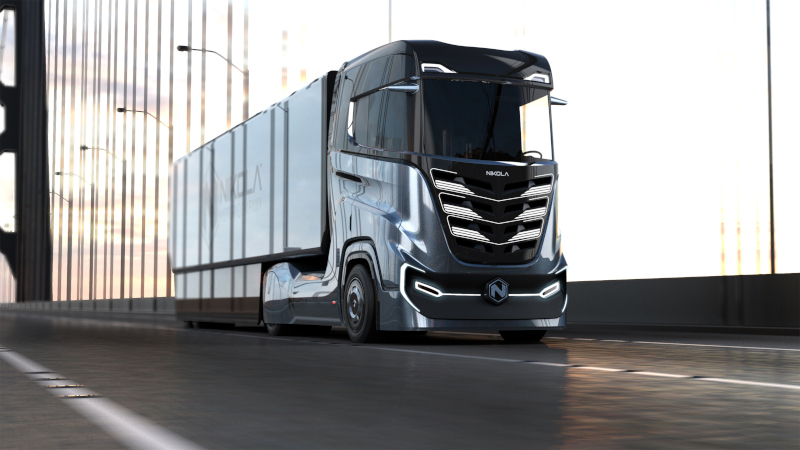 As it continues work toward disrupting the traditional diesel-powered truck market in North America, Nikola Motor Company is eyeing another continent: Europe. The company on Monday announced a European cabover version of its hydrogen-electric tractor model, with initial testing set for “around 2020” in Norway and full production by 2022-2023. The Nikola Tre will meet all European size and length restrictions for Europe. The European model will feature between 500 and 1,000 hp. and a range of 500 to 1,200 kilometers, depending on configuration. It will come in either 6x4 or 6x2 configuration. Nikola is looking for identify a European location for a manufacturing facility. The North American models, the Nikola One and Nikola Two (day cab), will be produced in an Arizona manufacturing plant. The company is spending more than $1 billion over the next six years to develop the facility on the west side of Phoenix. The company says it has orders for more than 8,000 trucks. All three models will be on display at Nikola World in Phoenix, April 16-17, 2019. Nikola is working with its North American partner, Nel Hydrogen, to develop a hydrogen infrastructure in Europe. Nel, of Oslo, Norway, is working to develop dozens of hydrogen stations in the U.S. to help support orders here, including an order for more than 800 trucks placed this year by Anheuser-Busch. “Nel has been good to work with for our USA station design and rollout. We will work with Nel to secure resources for our European growth strategy. We have a lot of work ahead of us, but with the right partners, we can accomplish it,” said Kim Brady, Nikola CFO. By 2028, Nikola is planning on having more than 700 hydrogen stations across the USA and Canada. Each station is capable of 2,000 to 8,000 kgs of daily hydrogen production, the company said. Nikola’s European stations are planned to come online around 2022 and are projected to cover most of the European market by 2030. The electric engine in the Nikola tractors is powered by a hydrogen fuel cell and produces 2,000 lbs.-ft. of torque and 1,000 hp. with a 320 kWh battery. Regenerative braking is used to supply power. Zero to 60 acceleration under load is said to be 30 seconds as compared to 60 seconds for a diesel unit. The battery storage system features 32,000 individual lithium-ion cells welded together for the battery pack – three times the size of a Tesla Model S P90D. MPG will be about double that of a diesel model, ranging from 13 to 15 mpg depending on specific operating conditions. With a 2,000 lbs. estimated weight saving (18,000 to 21,000 lbs. vs. 19,000 to 23,000 lbs. for a diesel unit), Nikola says that vehicles could potentially haul additional weight leading to up to $1,000 extra revenue per load.